A Greek woman in the Victorian town of Mildura has taken the local Orthodox Church committee to the Victorian Civil and Administrative Tribunal (VCAT), arguing her application to join the committee was rejected because of her gender. Maria Bakopoulos says her application to join the 30 plus member committee was unfairly dismissed and internal pleas to review the decision fell on deaf ears. She says the lack of communication and wiggle room from the community on the matter pushed her to eventually get a hearing heard by VCAT last Thursday. Bill Stamation, a financial committee member who fronted the tribunal, told Neos Kosmos the decision to reject Ms Bakopoulos’ application was “unanimous by the committee” and was not “based on gender”. He declined a number of times to say what exactly contributed to the application’s rejection to Neos Kosmos. The committee took the same stance at the tribunal, saying they do not need to disclose the reasoning behind the decision. Out of the 30 plus financial committee members currently elected, not one is female. Mr Stamation says he hasn’t received an application from a female member of the Greek community because he believes they are happy being a part of the philoptochos women’s society of Mildura. The women’s society has no say in how the committee spends its funds or what they do with their property. Ms Bakopoulos was compelled to become a financial committee member after she was denied access to the church for her father’s memorial, which she had booked months in advance. She says they argued there was no one available to open the church and hall because the committee was too busy preparing for a paniyri at the time. “Let me become a member of the committee and I will open it if it’s just a technicality,” Ms Bakopoulos remembers telling Bill Stamation when the incident happened. “It was just the usual round the bush,” she tells Neos Kosmos. She was told by family not to take the matter further lest the committee choose to close the church again at the year anniversary of her father’s death. “If they’ve done this then they will not let us have a funeral or something,” she says. Despite the church in Mildura not having a permanent parish priest, it gets by from a roster of travelling nearby priests who fill big dates and when they’re needed for baptisms, weddings and funerals. Ms Bakopoulos says she had a priest organised and ready for her father’s memorial dates, but the committee wouldn’t budge in opening the church. For anyone trying to get in contact with the church, its number listed on the Greek Orthodox parish directory is not connected and the phone number listed for its hall rings out. Ms Bakopoulos was told the committee would be in touch but that never happened. “It’s a closed shop… [they] never advertised about meetings,” she says. “I feel like they’ve locked us out for too long. At the tribunal last week, Ms Bakopoulos says many members of the Greek community of Mildura packed the room to support her. The tribunal will release a final ruling in the coming months. 1. It’s interesting to note how there is no mention to Helen Velissaris that the Women’s Philoptochos has been at loggerheads with the committee for quite a number of years, especially over the $80,000 that the Philoptochos had raised for the church’s furnishings, of which the committee has not accounted for even to this day. 2. What is the explanation for having so many members upon a church committee for such a small community? 3. Why is there no mention of the threats made upon the life of clergy and their family who have served in Mildura, or the reasons as to why the last priest departed Mildura? 4. Why are priests hesitant in settling and serving the community in Mildura? 5. Why has the Archdiocese been hesitant in sending a permanent priest out to Mildura? 6. Why is a large part of Mildura’s Greek community at loggerheads with the church committee? 7. 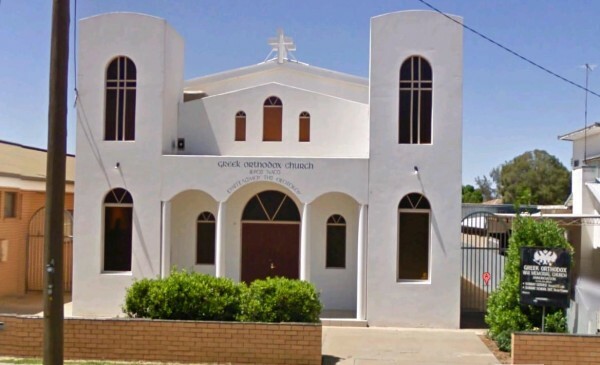 Why does the committee extort money from Mildura’s Greek community such as charging $3,000 for a wedding from one unnamed family, or threaten another family for having a visiting priest come and bless their house for free, and not informing them? 8. Why does not the committee disclose its reasons for not permitting Ms Bakopoulos onto the committee, when her reasons were merely to utilise the church to honour a departed family member? 9. Why have sound and upright Orthodox Christians who have served on the committee been expelled and excluded from service within the committee, is there fear that they would air out the dirty washing? 10. Why is it always these “community churches” seem to be owned by a private land trust that has its own “constitution” and is accountable to no one whether laity or clergy? And why is it, that its committee members are always the same people who happen to own title to the private land deeds, despite the whole community having contributed to the purchase of land and the construction of a church? 11. Why has the committee in the past been an insurmountable obstacle to the priests seeking to serve the pastoral and spiritual needs of Mildura which is afflicted with high rates unemployment, drug and alcohol abuse, and domestic violence, or the threat posed by a growing drug industry? 12. Why does the committee practice nepotism and encourage their family members to join the committee to the exclusion of others? 13. Why does the committee violate the ordinances of Orthodoxy by convening celebrations and the consumption of meat during major fasts such as Great Lent? 14. Why are non-Greek Orthodox Christians such as Russians, Serbs and so forth, victimised or excluded from church deliberations or to partake in services? 15. How much longer will Mildura’s Greek community be held hostage to the whims and dictates of a committee which has monopolised the only spiritual, cultural and social institution that it has, barring anyone who does not submit to their commands, despite those dictates often going contrary to Orthodox Church order? 16. Why do such committees and their so-called “community churches” always seem to remain as dead private clubs devoid of vision for the future, by which committee members profiteer from? And why is it, these churches are always abandoned when they cease to be “profitable” and the end result is a church building in need of repairs, owing money and the absence of associated institutions that invest in the future of the community such as schools, youth centres, nursing homes, museums, libraries etc? In any case, I wish every success to Ms Bakopoulos in her efforts to hold the committee of Mildura’s Annunciation to account, because the damage they have caused the whole community and to serving priests, is disgusting to say the least, and the Greeks of Mildura are fed up with them.